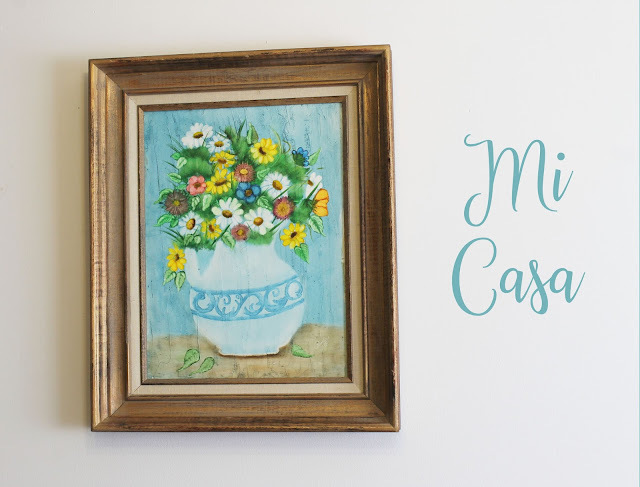 I changed the name of my blog from Foxxy's Cottage to Mi Casa. I was really wanting a change. I've had a blog for nine years. That's a long time. As you all know, a lot of things can change in the span of nine years like interests, hobbies, needs, and wants. When I first started blogging I blogged about my family. The name of my blog was Ruby Lane. My kids were little and I was a stay at home mom (still am). That was my whole life, my kids and my home, so that's what I blogged about. I did that for a few years until I had a problem with one of my sisters. My blog was no secret. Everyone knew I had a blog. I was proud I told everyone. Blogging was at the peak of its popularity back then. I started noticing a change in behavior with one of my sisters. She had an attitude, she made smart alecky remarks. One day it all blew up in my face. She called me up screaming at me over the phone. She told me I was a goody two shoes and blah blah blah. She ranted, called me names, and threw a lot of things in my face. All the while she was crying and screaming. I was babysitting her kids at the time too. Hows that for gratitude? A lot of anger and resentment in that exchange. She got jealous over reading my blog. She had this idea in her head that my life was a perfect fairy tale and it made her so angry. I ended up deleting that blog permanently. It made me sick how something that brought me so much enjoyment brought about so much hate and anger in someone else. So I was done with it. I pushed the delete button. The idea of outsiders reading about what my family did wasn't such a wonderful idea anymore. In fact I hated it and wondered why I ever did it. This is really ugly but every one's blog header looked like this back then. I stayed away from blogging for about a year. I missed it. I wanted to come back but I knew I couldn't blog about my family. I decided to open up another blog (this one) and blog about my home, decoration ideas and stuff like that. I titled it Summerhouse Cottage. 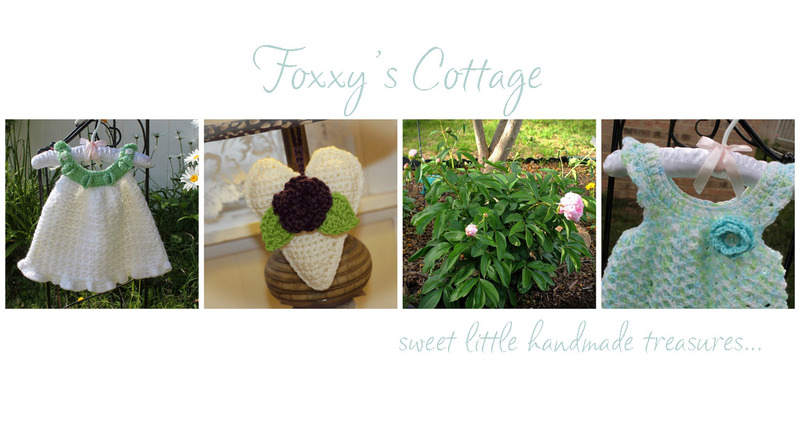 I kept the name for a couple of years then changed it to Foxxy's Cottage because we moved and the other name didn't quite fit anymore. I've had this blog for about five years now. I've kept this blog a secret. Only my husband and kids know about it and that's how I'd like to keep it. Somewhere in that time by blog morphed from a home decor blog to a crochet blog. See what I mean about interests changing over the years. Well anywho, now it's called Mi Casa. I figured that name would be fitting no matter where I go or what I decide to blog about. It's interesting looking back how our lives and interests change through the years. If any of you out there have had your blog for a long time you've probably seen your blog morph as well. Oh well, that's life. Things don't stay the same forever. Change is always happening and we just have to adjust and try to keep up. Oh and by the way, my relationship with my sister has never fully mended. She still takes jabs at me whenever she can sneak them in. She's still angry I suppose but I've moved on. It's in the Lords hands. I turned it over to Him a long time ago. I let Him take care of these type of things for me. He handles them so much better than I ever could. Things have certainly changed on my blog, too. When I started I was living in a tight little suburban community and now I live in the country. Different lifestyles bring on new adventures in life. I also have a sister, that I have had to turn over to the Lord. I can't handle the hate that she has built up through the years. It's sad, but I pray for her each night and hope that she can someday replace her jealousy with peace and love. I miss having a sister. I've been blogging about as long and mine has remained the same, photos and thinking. Love the name and look forward to reading your little adventures through life. I was sorry to read about your sister, sadly you can't choose your family. Hopefully there will be an improvement over time. Take care. Mi Casa is a wonderful name, I like it. It's always enjoyable to visit your blog no matter what you blog about. Looking forward to new posts at Mi Casa! Lovely name! Sorry about the situation with your sibling. I too had a previous blog that I deleted, it was needlework related, but I used to include everyday life doings frequently. I too have changed my blog name several times and it does change in different directions over the years. I love your new blog name and wish you a lot of happiness with it. Blogging is hard and I'm sorry about what happened with your sister. Maybe over time things will get better. Love the new name (actually, I loved the old name too! ), and I hope this blog continues for some time, and that it will bring you the joy you intended. Families. It's sad that your sister viewed your blog this way, but maybe you're like many of us and tend to keep the unpleasant things in life to yourself. Maybe she didn't realize that. No one's life is perfect and we all have to deal with hardships. Whether or not we share that with the entire world is a personal preference. I had a huge blow up with my sister years ago, and I still am very careful about what I say to her. We have very slowly built back our relationship, but it's never going to be the same as it was years ago. You're right to leave it in God's hands. I kept my blog secret from family members for a long time, but finally decided to tell my siblings of it one at a time. But then none of them ever even visit my blog ;) Can't win. I enjoyed reading back a few posts (catching up!) and seeing your beautiful afghan and doilies. Enjoy your reading and your upcoming summer break. It's nice to slow down and just enjoy the nice weather now. Hugs! Congratulations on the new name of your blog! I love it! Sorry to hear about sister's issue with it before...too bad for her. I was in a similar position with a friend of mine...needless to say our friendship broke over it.